Are you looking for the most affordable yet easy and fast way to spend 6 hours taking the drivers’ education for adult’s course (www5.esc13.net/drivers/)? If yes, then this is the right place for you! This course fulfills the mandatory requirement for students between the age of 18 and 24. However, it is a convenient way even for those above 25 years of age because it is online! You will get maximum freedom of learning as the course offers you convenient features. The duration of this course is 6 hours. It is categorized into 9 units. Each unit is filled with interactive excitement and fun. This is because we believe that you should get your license while enjoying throughout your learning. On the completion of each learning unit, you will be required to clear a show quiz. Please remember that you will not be pressurized for this as you are allowed to take the review quiz a lot of times until you succeed. We know how important it is for you to know our reputation and credibility in the market. 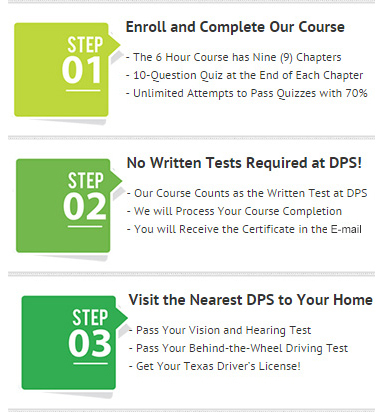 Therefore, we have taken approval of this online course from the Texas Department of Licensing and Regulation (TDLR). This way, you can meet all your requirements to get a license if your ages are from 18 to 24. However, you can still take the course if you are 25 or above. The texas drivers license requirements for 18 year olds also comprises of the final exam. It can also be called a written test so that you can get your license. So, you will not be required to take the test at the Department of Public Safety later! After you have finished this course, we will process and mail you your certificate of completion. When you have received it, you can show this proof to the DPS to inform them that you have already cleared the written test. So, you will only need to take a behind-the-wheel and vision test for getting the license. It Takes A Few Minutes To Sign Up! Get started by signing up in just a few minutes. While setting up an account, you are required to select a user ID and set a password. 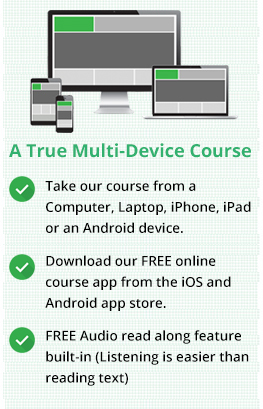 This will enable you to get access to the course from anywhere. If you have any questions, you can feel free to call or email us anytime you want. Or simply chat with us live online. We have made our customer support available for you 24/7.